To those Democrats and Republicans who want to use the Pope to prop up their political agendas, a few thoughts. Both parties should feel appropriately chastised by the Pope's announcements. Both parties are heedless of the dignity of human life. Both parties owe their existence and their election victories to appealing to the baseness and the egotism of their respective bases. Pope Francis is neither a liberal nor a conservative. He is a follower of Jesus Christ. And just as Jesus offended all who based their lives and measured their well being on human philosophies, Pope Francis will necessarily offend politicians and partisans of both parties. But if they will heed the gospel message they will find life with God and be challenged to find ways in which they can give that life to others. I'm not a Roman Catholic Christian. I'm a Lutheran Christian and a pastor. I take great joy in the Pope's ministry and words and I pray that we will also listen closely to His message. We all have a lot of sins to give up and, in Christ, a lot of life-empowering grace to claim by faith in the crucified and risen Savior. I mentioned David McCullough's book, The Wright Brothers, in a post last night. I finished reading it a few days ago. It's a great and surprisingly quick read and the first of all the biographies of the Wrights that I have read that have helped this caveman mind appreciate the peculiar insights the brothers had that allowed them to break through to powered, heavier-than-air flight. As I said last evening, like all of McCullough's books, this one is a treat! I'm also now reading Bill Mowry's The Ways of the Alongsider, a helpful guidebook on how Christians can share their faith with others, life to life. Over the past year, Bill has been my coach in deepening my walk with Christ. He's as helpful in print as he is one-on-one. And, in the wake of the decision to resume referring to the mountain we once called Mount McKinley as Mount Denali, I'm re-reading Kevin Phillips' short biography President William McKinley. Of all the US presidents to come from Ohio, McKinley was by far the best. Phillips argues that the Canton native was a consequential president in two ways. First, he upended the partisan logjam that had for several decades produced Republican presidents interspersed with Democratic presidents, back and forth, leaving the country with no clear policy direction for more than twenty years. McKinley created what remained a sustained Republican occupation of the White House, with the exception of a narrow victory for Woodrow Wilson--brought about by Theodore Roosevelt's 1912 run for president on the Progressive Party ticket, thus dividing Republicans--from 1896 to 1932, when Democrat Franklin Roosevelt brought basic dominion for his party through 1968. Second, McKinley, Phillips argues, is not Mount Rushmore-worthy, but safely near the top of the second-tier of effective presidents. He was, it can be argued, the first modern US president in both domestic and foreign policy. Phillips' discussion of the unique role Ohio played in nineteenth century America alone makes the book worth reading. The state was the country's greatest center of innovation, business risk, and scientific inquiry, playing a part in world history that California's Silicon Valley later played some one-hundred years later. After their success at Kitty Hawk, Dayton, Ohio's Wright Brothers still needed to perfect their powered airplane technology. Instead of trekking back to Kill Devil Hills in North Carolina, chosen for its twenty-mile per hour average winds and its remote location on the Outer Banks, the Wrights decided to stay in Ohio, relying on the engine forged by their employee, Charlie Taylor, and a catapult to set and keep them aloft. 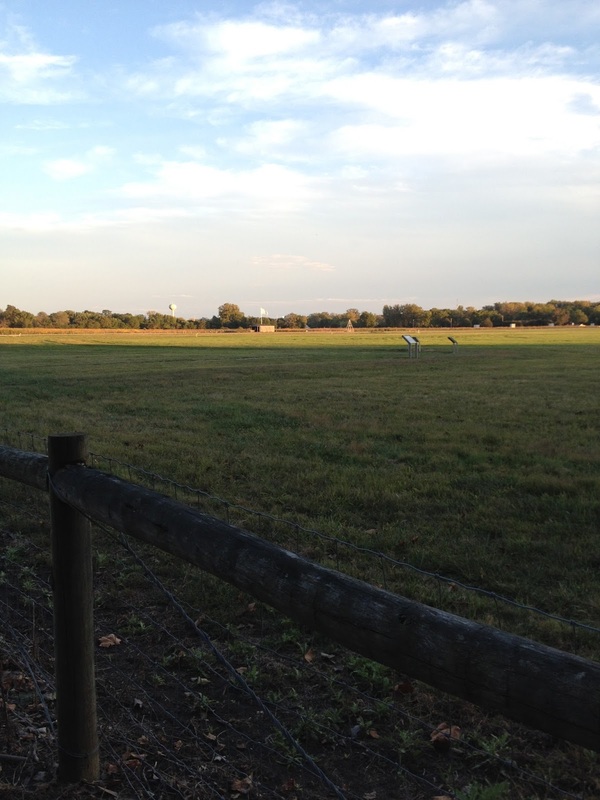 During the "flying seasons" of 1904 and 1905, Wilbur and Orville Wright experimented at Huffman Prairie, an 84-acre parcel of flat land that became the world's first airport. The brothers took hundreds of test flights there. Huffman Prairie was about ten miles from the Wrights' home on Hawthorn Street and from their bicycle shop on Third in Dayton. They reached Huffman Prairie via the Interurban trolley that ran between Dayton and Springfield. The picture below shows the spot where the trolley stop was. 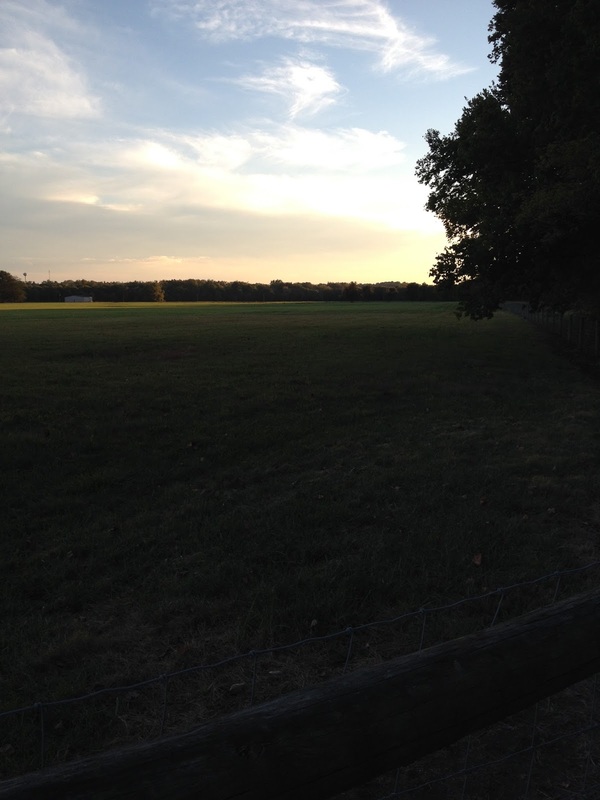 As you approach the prairie, you travel along a narrow, tree-lined road that must be on the old trolley right-of-way. Huffman Prairie is now part of the Wright-Patterson Air Force Base complex in Fairborn, Ohio. 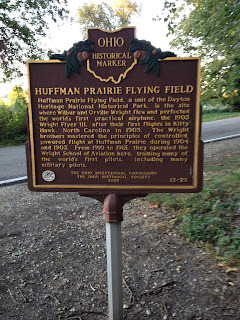 Below is an Ohio historical marker telling a bit about Huffman Prairie. You can walk all around the site where the history of the world was significantly changed. 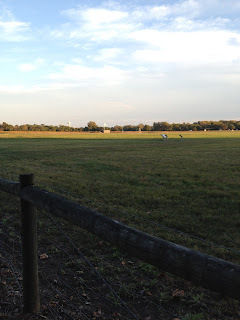 Below are two views of Huffman Prairie. The second one shows replicas of the Wrights' hangar and catapult on the site where they placed them in 1904 and 1905. Lake 3 at the Darby Bends Lakes section of Prairie Oaks Metropark near Columbus. Saw lots of Monarch butterflies there today during a late afternoon walk. It’s good to have confidence. I believe that God wants us to feel confident in ourselves, children made in the very image of God, redeemed by Christ so that we can claim our inheritance as God's children. But arrogance is an altogether different thing. The wisdom of the world says that pushing your way to the top is just the way things are supposed to be. But, in our second lesson for today, James 3:13-4:10, James reminds us that such an attitude isn’t the wisdom that comes from the God we know in Jesus Christ. Followers of Jesus Christ know that arrogance is inconsistent with our faith. We know, too, that Christ gives to all who turn from sin and follow Him, all who grasp God’s grace, the unshakable approval of God. We know that we have God in our corners forever, helping us to become our best selves. And when you’re confident of your identity as a child of God, you don’t need to resort to the pathetic crutch of arrogance. Like Martin Luther, when dogged by temptations or doubts about our value, we can say, “But I am baptized!” We belong to the crucified and risen Jesus Christ! Yet the war in the gut that James writes about in our lesson today seems to happen inside those of us who believe in Jesus Christ as much as it does in non-Christians. Why do we Christians refuse to allow the wisdom that God willingly gives to all followers of Christ, just for the asking, to guide our lives? Some psychologists tell us that we tend to live out of certain stories that we tell ourselves about ourselves. Sometimes, we live out of stories of arrogance. Often, our self-told stories cause us to sell ourselves short, believing that we’re not enough. James and the rest of the Bible would say that all these stories come from the devil. But because we often believe those stories, we can make shambles of our lives, often compensating for our perceived inadequacies by adopting attitudes of arrogance. Whether the stories we tell ourselves lead us to feelings of arrogance or inadequacy though, the result is always that we fail to tap into the power, love, and goodness of God to feel confident about who we are as children of God. The consequences of believing false stories about ourselves can be seen not only in the lives of individual Christians, but also in the lives of many Christian congregations. Gerald Mann tells the true story of a pastor and his family who had something horrible happen as they were arriving in a new community, where a local church had called them. Just as they entered the town, their baby, the couple's only child had a seizure. They rushed him to the local hospital where all attempts to revive him failed. There, in the waiting room where she’d gotten the horrible news, the mother was understandably distraught and screamed out to God, occasionally uttering profanities. One of the nurses on duty was a member of the congregation. She told the congregational leaders how the grieving mother had initially reacted to the death of her child. Those leaders, in turn, went to their denomination’s area superintendent to say that because of how “unspiritual” the pastor’s wife was, they wanted a different pastor. The superintendent told the leaders that the members of that church needed to learn what it is to be the church, a fellowship where imperfect people can share the strength and the power to live which the resurrected Jesus gives to all who believe in Him. Here you had a congregation whose members believed a false story. They believed that if their pastor had an imperfect life, it would make their lives less perfect. He violated the false story they were telling about themselves and they didn’t want him messing the story up by telling the truth that this world isn’t always perfect even for Christians and that while followers of Christ aren’t always strong, we have a God to Whom we can go to be strengthened together. The Church is called to be the practical, real-life laboratory where Jesus Christ gives us new eternal identities born not of looking out for number one, but of letting Number One look out for us, where God’s children look out for each other and our neighbors. James says that we have those kinds of congregational fellowships when we ask God to help us own the humble confidence and self-assurance that belong to His children. It comes, he says, when we surrender to Christ. That’s when we quit having to prove ourselves, can bask in God’s approval, and can look beyond ourselves. It’s only when we utterly submit to God, taking responsibility for our sins and seeking His forgiveness for the sake of Jesus Who died for imperfect people like you and me that we have true wisdom, as well experience God’s forgiveness and new life. The woman’s first stop was a palace. Sure that everything would be joyful there, she knocked on the door, explaining that she was looking for a home without sorrow. “You’ve come to the wrong place,” she was told. And then the owner of that palace recounted all the sorrows that he and his family had experienced in spite of their wealth. The woman thought to herself, “Who is better able to help these people than I, who have had such misfortune of my own?” So, she stayed to comfort them. Later, she continued her search. She went from hovels to palaces and in each place, she got so involved in helping other people through their griefs that she was able to deal with her own. In forgetting about herself, she found healing and peace. Arrogance destroys faith, fellowship, and hope. Buying into false stories, whether they’re ones that tell us how great we are or how insignificant we are, or how aggrieved we are, creates conflicts within us and creates our conflicts with others. Humble surrender to Jesus Christ, allowing Him to enlist us in His army of love for God and love for neighbor (1) builds faith, (2) enhances Christian fellowship, and (3) fills us with the hope of the Good News that all who turn from sin and believe in Jesus Christ have life with God for eternity. The wisdom of this world--which is really the wisdom of hell--tells us to look out for ourselves. The wisdom of heaven says to reach up to Christ, reach in to be mutually strengthened in faith through the fellowship of Christ’s Church, and reach out to others with the good news of Jesus. Worldly wisdom leads to turmoil within and turmoil without. The wisdom of God, the wisdom that comes when we follow Jesus Christ, leads to peace in our souls and peace with others. Which wisdom will you choose? Which story will you believe, your own story about you or the story Jesus Christ has created just for you? On whose wisdom will you build your life, your own or that of God?